The simplest sign of affection is, perhaps, holding hands. The Beatles’ first chart-topping single in America was “I Want to Hold Your Hand.” Many of their early tunes are simple songs about love, and “Hold Your Hand” is the most basic of these. The song describes the power of holding hands with someone you have affection for; it’s a simple song about the most basic element of love, and this is its power. The same holds true for Pixar’s latest masterpiece, WALL-E. In the film, the robot WALL-E falls in love with the robot EVE, and wishes desperately to hold her hand. This is a theme throughout the picture, and the fact that the viewer becomes so involved in wondering whether or not these two will hold hands speaks volumes about the film’s power. WALL-E opens in space, with the song Put on Your Sunday Clothes from the musical Hello Dolly! playing. As the song plays, the camera pans down to Earth…but it doesn’t feel like Earth. We see skyscrapers that look familiar, but we then learn that they are skyscrapers made of trash. We then meet the little robot responsible for collecting the planet’s trash into these cubical skyscrapers; a Waste Allocation Load Lifter---Earth Class, or WALL-E for short. Put on Your Sunday Clothes continues, and the merging a very happy song with an immensely dreary situation is nothing less than disturbing. It’s like opening I Am Legend with Here Comes the Sun. WALL-E travels around making trash into cubes and collecting knick-knacks in his small cooler that he attaches onto his back. He takes the cooler back to his ‘home’ and puts it all in his collection, not unlike Ariel in The Little Mermaid. The opening of the film is downright unsettling, but once we’re following WALL-E around in his daily routine, there will be a big smile on your face. The first half hour or so takes place entirely on Earth, and is entirely without dialogue, save for words spoken by recordings and advertisements WALL-E uncovers while cleaning up the trash. This first half hour is simply unbelievable. It’s a giant freight train of quality filmmaking that hits you at 100 miles per hour, and while I was very excited to see this movie, I wasn’t ready for it. To say the film is mind-blowing is a gross understatement. At its core, the film is a love story. A beautiful love story. A robot named EVE comes to Earth on a mission to find plant life, and WALL-E falls head over heels in love with her. Their romance, which is one sided for at least half of the film, is more emotional and heartfelt than any on-screen romance I’ve seen in years. And they’re robots. Wow. When EVE leaves Earth, WALL-E follows her, and they arrive on the Axiom, the space ship that humanity lives in after abandoning Earth. The humans all morbidly obese, move around on floating chairs and do nothing for themselves. It’s a statement about humanity over-reliance on technology, a theme that is present throughout the film, but never feels preachy. This is one of the movie’s greatest strengths; there’s a great message here about our faults as humans, but the film also showcases humanity’s greatest qualities. It starts out pessimistic, and then shows us a universe of optimism. Combine this with the romance, and you’ve got Pixar’s deepest film yet. Anyway, WALL-E and EVE have many great adventures on the ship, and I’m not at liberty to divulge anything more about the plot. You have to discover it for yourself; that’s part of the grand experience this film presents. Being a Pixar film, the animation is of course gorgeous. I’ve never been a fan of photo-realism in film. Why animate it realistically when you could just shoot it? WALL-E uses a photo-realistic animation scheme and for the first time ever, it works wonderfully. It’s a photo-realistic image of amazing sights we’ve never witnessed; things that we are familiar with, such as humans, are animated in a more cartoony style. I saw the film in a DLP theater (an extremely high-resolution digital projector) and was transported to another world. The animation is phenomenal, and DLP enhances it. If you can see the movie in DLP, do so. It’s stunning. The animation is more important than ever due to the general lack of dialogue. As I said above, the first half hour is devoid of dialogue and there’s not much talking for the rest of the film either. The only major speaking part, that of the Axiom’s captain, is voiced by Jeff Garlin (he does a great job and the animators really animate the vocal emotions quite well). Despite the fact that most of what we hear are R2-D2-esque beeps and boops, more emotion is conveyed than in any other film I’ve seen all year. Ben Burtt, the genius behind the R2-D2 voice, provides the sounds for all the robots. There’s such a wide array of voices and emotions within the robotic voices that it would be a crime if he doesn’t win another sound Oscar. There are many levels this film can be enjoyed on. The most basic, and that which kids will enjoy it for, is humor. I was laughing on a very consistent basis throughout the film. There’s great sight gags with WALL-E and other robots, as well as some fun little jokes about ordinary devices the robot finds fascinating. On the far other end, this film can be viewed as a deep, thoughtful analysis on our reliance on technology. This theme will soar over the heads of little ones, and so many of the visuals are animated around this theme that there are parts parents will have to explain to kids. Despite that, this message is conveyed in such a thoughtful, immersive way that you feel mentally enriched for watching it. The layer of enjoyment that is the richest lies right in the middle. It’s not squarely aimed at kids, but won’t totally go over their heads either. It’s the love story between WALL-E and EVE. It’s so beautiful, so touching, so moving. Some of their interactions are so tender and heartfelt that a warm feeling will soar through your being. One very creative aspect of the movie is WALL-E’s obsession with the film Hello Dolly! When he first brings EVE back to his home, he shows her a prized VHS of the tape, and recreates a dance number using trash. It’s a great bonding scene for the two, and one of the most heartfelt moments in the film. Early in the film, while watching Hello Dolly!, WALL-E records into his databanks the song It Only Takes A Moment. While watching the stars, he listens to the song and quietly years for the experiences the song relates. He plays this when he meets EVE, and later in the film, when EVE finally falls for WALL-E too, the song plays again. It’s so simple, but so brilliant the way their romance is structured around this. I was spellbound by WALL-E; it made me remember why I fell in love with film in the first place. A great story with heartfelt emotions presented in a fantastic way. That’s great cinema. When the credits rolled, and for a good half hour afterwards, I had trouble thinking of anything else. I was basking in the perfection of the film. The film reminds us of the power animation can have, and the deep stories it can tell. I can say, with almost complete certainty, that WALL-E is the best film of the year so far. There’s been only been one other film this year that rivals it for that title (In Bruges, which I reviewed in February). 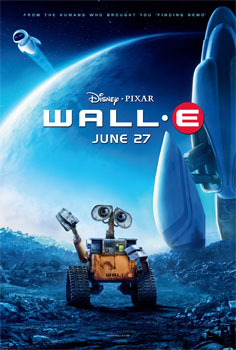 If WALL-E isn’t the best film of the year so far, it is, at least, the best major-studio released film. It’s Pixar’s best movie to date, and one of the greatest animated films ever made. Perfection is a term that one can not throw around lightly. I don’t think I’ve ever used it in describing a film, but WALL-E deserves this praise. It is a perfect film. A perfect film centered around the simple, but immensely emotional concept of holding hands.